Last weekend I went to Roger Waters’ concert “The Wall”. For those that don’t know (and I explain this because an American colleague didn’t know Roger Waters and “have heard somewhere” about Pink Floyd), Roger Waters was part of a very cool rock band called Pink Floyd. “The Wall” is the title of one of their albums, from 1979. It includes the very famous song “We don’t need no education… Hey, teacher, leave the kids alone!”. Anyway, the whole album is pretty good, although I don’t have the habit of listening to this kind of music. It is so good that, 30 years after its release, this guy decides to do a world tour on it and the concerts were almost sold out everywhere. I read that at the time it was an album that told the story of a character, called Pink, and his psychological problems, relationship difficulties and isolation. There is even a (quite disturbing) movie about it. But this more recent tour focuses mostly on other issues, such as war and capitalism. And it really makes an impression. It was interesting the stream of feelings I had during the show, how overwhelming it was. I don’t think I had ever felt this before during a concert. So here’s me trying to explain to myself why it was so exciting and disturbing at the same time. First of all I should note what happened before the concert. One of my friends from Brazil was visiting Vienna for a few days and we met to catch up. It was very nice. I was very happy to see how well he’s doing. At some point he mentioned how I was in Brazil in April and hadn’t told anyone, which is true… I don’t know for sure why I did this. In any case, it was wrong. This made me a bit sad and disappointed at myself. I was also reasonably stressed because after the concert I had to help my sister with a test and pack my bags to leave to Istanbul for a conference the next day. But I was willing to go to the concert and have a good time. From the first 30 seconds we knew it was going to be amazing, with fireworks, props and visual effects (just take a look at the opening). It was super cool. At some point, the huge round screen in the middle of the stage started showing faces of people followed by their information. They were all people that had died in wars and conflicts around the world. I started noticing that the deaths were all more or less recent, all in the years 2000 and something. This touched me. You see, I think I am a pacifist, and every time I see these conflicts on TV (Syria, Libya, Egypt, Palestine/Israel, etc. ), I think: “Why are these people fighting? Don’t they realize that there are people dying?”. For me, the suffering of losing loved ones and destroying your home should be stronger that any political fight. So seeing those pictures made me very sad. My eyes even watered. Then there was intermission and I calmed down. On the second part there was strong criticism to capitalism and this whole culture of profit and exploitation. At this point I started thinking how things could have turned out like this. How can people seem so heartless? How can they not see the damage of their decisions? And I thought about this and I saw images of soldiers reuniting with their kids and injured people in the concert and this made me cry. I think it’s very disturbing to realize how people can cause so much damage without noticing it. And I am afraid of being/becoming such people. And every time I think about this, I just want to do something that would change the world and make a big difference. But I am more and more convinced that a big difference requires lots of people doing the right thing. So I’ll do my part and do the right thing (as I gradually find out what the right things are… people that know should make a list). Let’s just hope I don’t become comfortably numb. I think in the end it was confusing because it was a concert. And I should watch it, sing the songs and feel good, like it was in Paul McCartney’s. Except it was not like this. I watched it, thought about life, got sad and disappointed in the world and wanted to change it. Well, I guess if half of the people there had the same feeling and are willing to do something about this, it was the most successful concert of all times. Two years ago I was running around Grinzing, in the north of Vienna, and after going up a very very long hill (which I did not manage to run all the way) I found this nice public swimming pool hidden in the woods. Since I was running and it was a sunny day and it was not expensive to get in, I decided to have a look, even though I did not have any swimming suit with me. As I entered this place I could not believe my eyes… This was public, really? 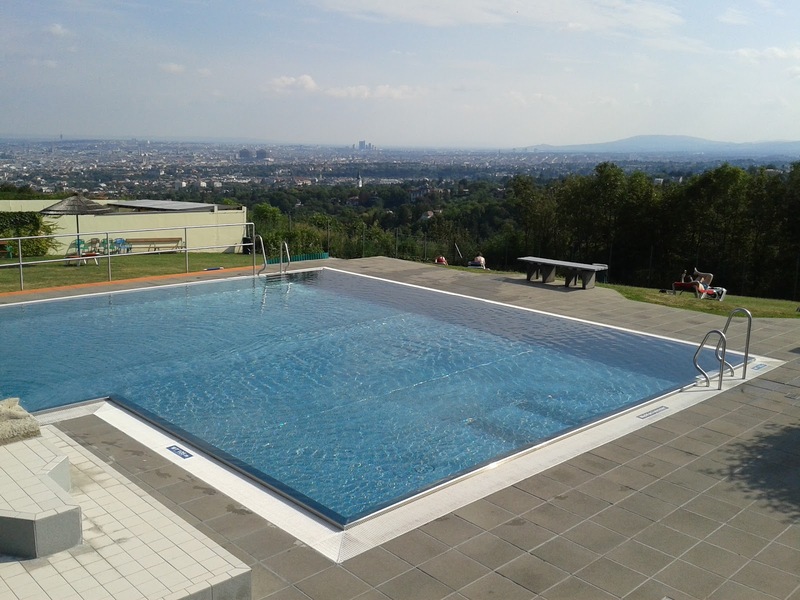 Super super cool swimming pools, with a nice view of Vienna and lots of green area around. I just wanted to jump in with clothes and all. But I didn’t. Two years later I finally managed to take Joao there. This time I took the swimming suit, towels, snacks… the whole day-at-the-club-kit. Even though we got there at 2 in the afternoon, we could enjoy a lot. By the way, the pools are made of some kind of metal, not tiles. It sounds weird, but it feels very good! They have a sport swimming pool of 25m, a relaxing swimming pool (picture below) with the Jacuzzi jets to massage our backs, a kids swimming pool with a cool slide in the shape of an elephant and a lot of other things. This weekend a visitor came to my plant. I call her Jo Ann. She left yesterday sometime at night… I think she’s cute, isn’t she? Just like those ladybugs we see in cartoons. 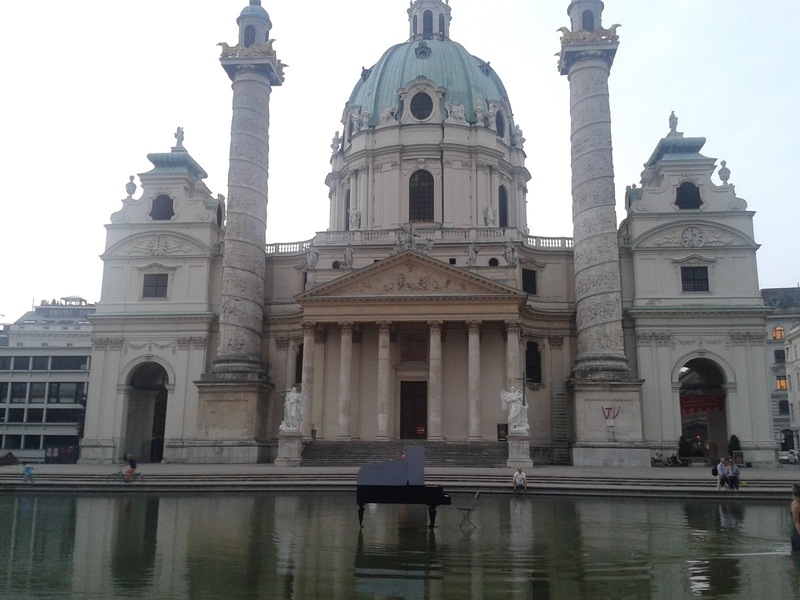 Other than that… We are all melting in Vienna. It’s been a few weeks now that we have temperatures over 30, and this week has been over 35. And it’s summer vacation. And I am working. Damn. But work later. Nice things first.